Mike Yang/Contributing Photographer On Jan. 31, the Binghamton Art Museum premiered its exhibition "Visions and Imagination: Cuban American and Argentinian Art,” created by curator Lynette Bosch. 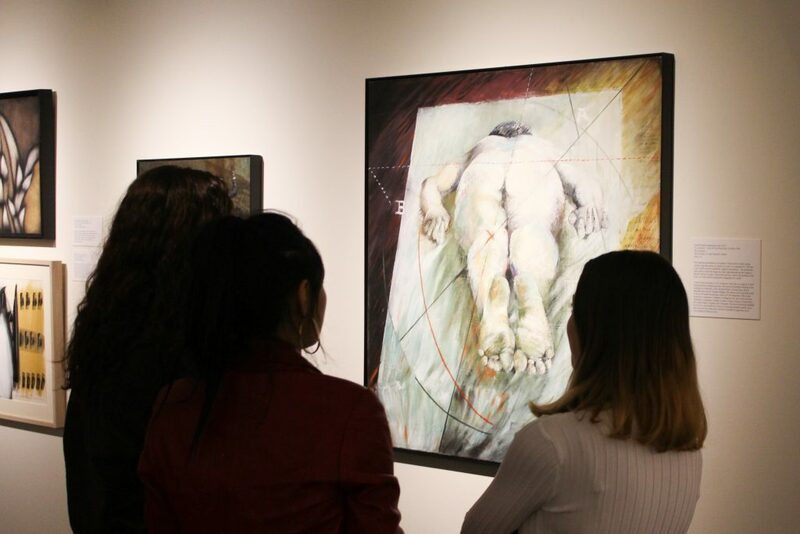 Last Thursday, the Binghamton University Art Museum welcomed a new exhibition titled “Visions and Imagination: Cuban American and Argentinian Art.” The opening featured a public reception at the main gallery and a discussion held by curator Lynette Bosch, a professor of art history at SUNY Geneseo. Many pieces in this collection were donated by Jorge and Norma Gracia, each of whom spoke to the audience about some of the works they permanently gifted to the museum. The art in this exhibition is comprised of exclusively contemporary Argentinian and Cuban American artists. It includes various mediums like oil on canvas, acrylic on canvas, ink and composite photo collage and explores themes of philosophy, self-discovery, culture, religion and spirituality. The works are all connected through their shared cultural background and historical narratives. Jorge Gracia, a SUNY distinguished professor at the University of Buffalo, discussed his love of collecting Cuban art as a Cuban American. Jorge and Norma Gracia donated 13 of the pieces on display from their own private collection. The first pieces the audience encounters are by Mauricio Nizzero, an Argentinian artist whose work is based on short stories by Jorge Luis Borges. Nizzero’s work is constructed on paper using ink and coffee, uncommon yet effective materials. The piece students see on the posters around the Fine Arts Building advertising the collection is titled “Foraging People” by Carlos Estévez. Created with pencil and gouache on Nepalese lokta paper, Estévez provokes questions about the human consciousness through the dark and mysterious drawing of a head. Several works in the collection induce a sense of disquiet. Armando Mariño’s “The White Peacock,” for example, embodies this sense of the unusual with its juxtaposed imagery and significant contrast in color. A particularly striking piece by Cuban American artist DEMI stands out on a wall in the middle of the floor. Hairless and handless human figures, presumably children, dominate the large canvas. The painting is vibrant in its energy and livelihood, but there are mysterious undertones. “Some of [the pieces] seem to disturb you a little,” said Emily Seale, a sophomore majoring in biochemistry. The localization of this particular collection paired with Latin American history appeals to students’ appreciation of multicultural perspectives, including Eddie Yuan, a senior majoring in economics. All contributing artists have been based in New York at some point in their lives, whether to procure degrees, create art or settle down in places like Manhattan or Catskill, NY. According to Bosch, this was intentional. “One of the goals was to introduce [audiences] to Cuban American artists working in New York state so that we could gravitate in the area,” Bosch said. Jorge Gracia said that he was always looking for places that wanted to accommodate these kinds of artists and works, and Binghamton was the ideal location. “This particular exhibit was created because I was looking for a place that would actually have interest in this material — in other words, Latin American works,” Gracia said. Apart from the artists and themes explored throughout the paintings, the art of collecting art is in itself celebrated here. The exhibition will be open to the public until March 14 with a free admission fee.